Mega, mega squeals!! It’s almost Easter time!! 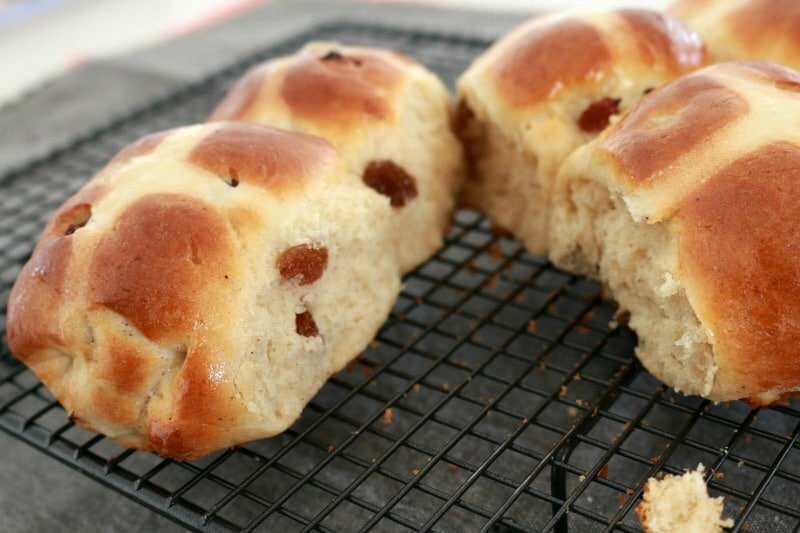 If you haven’t eaten a hot cross bun (or 20!) 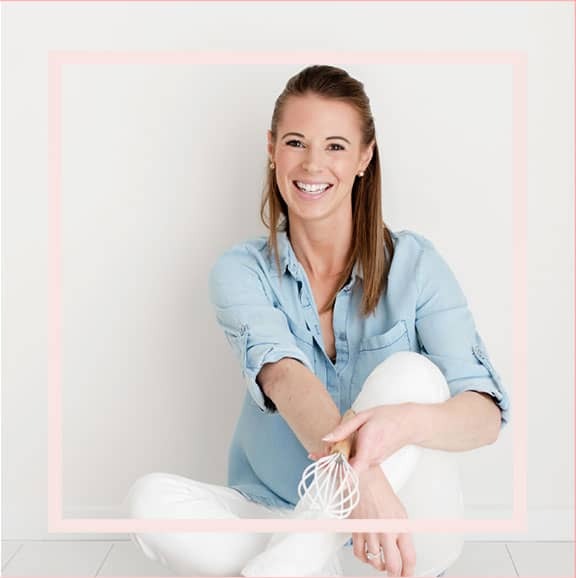 or nibbled on a few Easter eggs yet, then there’s something very, very wrong with you (or you just have a whole heap of self-control, in which case, high five to you!). 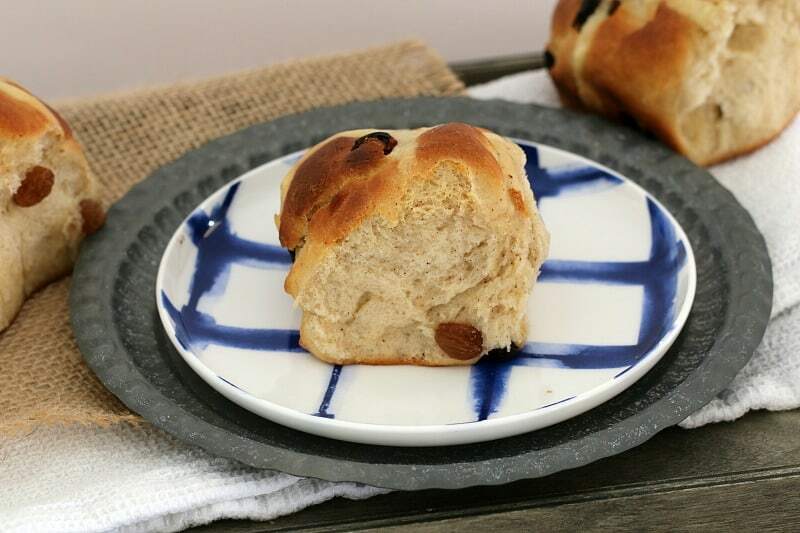 Our traditional hot cross buns are very kid-friendly and make the perfect lunchbox snack. We use sultanas rather than mixed peel in this recipe as they always get the kiddy tick of approval. Pop them in your little ones lunchbox plain or add some butter and jam. 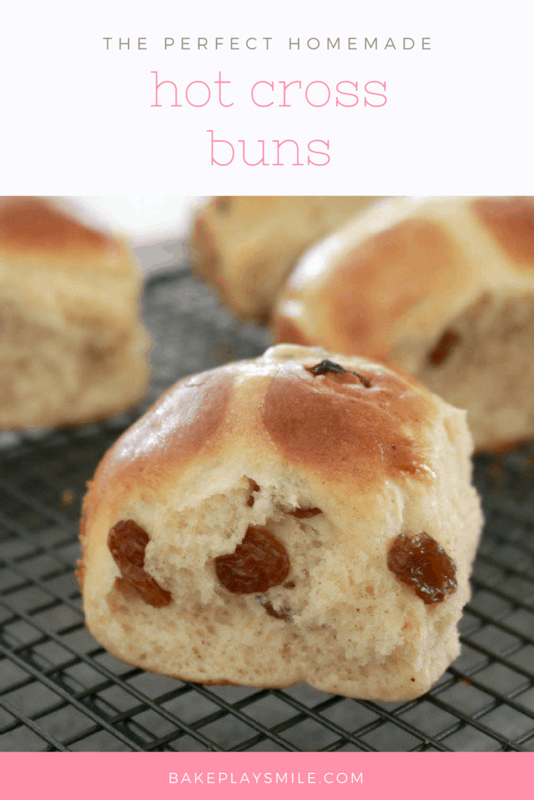 Making hot cross buns can be a bit time consuming, but it’s important to give the dough enough time to ruse so that you end up with deliciously soft and fluffy buns! Make sure that your yeast is in date and still active. Mixing warm milk with the yeast will help it to dissolve and activate. You’ll know it’s ready because it will become frothy. Leaving the dough in a warm place is essential for it to rise and double in size. If it’s a hot summer day, you can leave it in a bowl (covered with a tea towel) in a sunny spot. If it’s not a warm day, turn your oven on, allow it to become warm for a few minutes (but not hot! ), turn it off and place the bowl with the tea towel inside. I’ve also heard of people using hot water bottles under their bowl to make their dough rise!!! 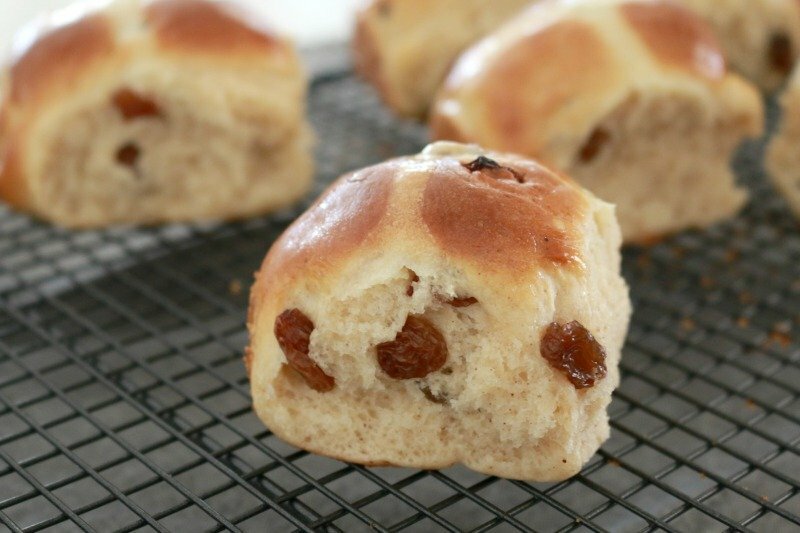 Making homemade hot cross buns really is so easy. 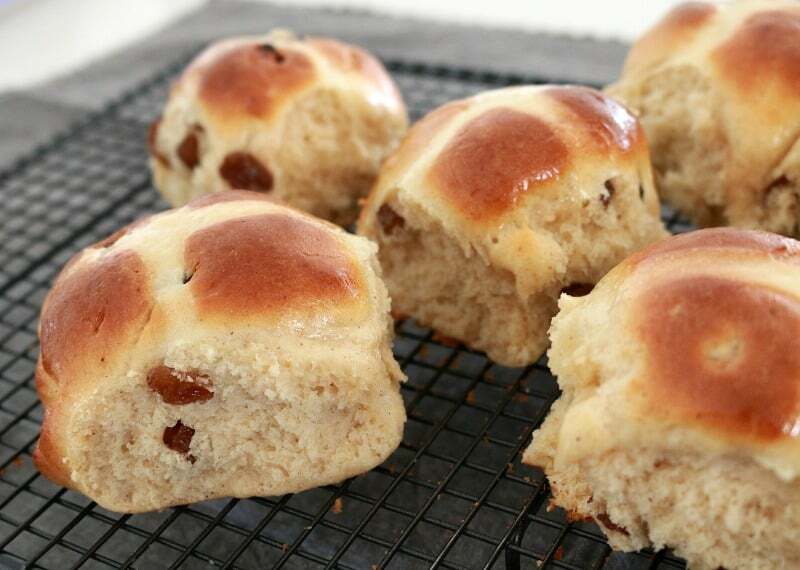 With just a little bit of patience, you’ll have delicious fluffy buns in no time!! Add the dry yeast to the cup of warm milk and whisk together. Place the cup in a warm place for 15 minutes or until the mixture has become frothy. In a large bowl, sift the plain flour, nutmeg, cinnamon and salt. Add the caster sugar and mix to combine. Add the butter and rub together. Pour in the yeast mixture, the egg and the warm water. Stir together until the mixture forms a round dough ball. Grease a bowl with cooking spray and place the dough ball into the bowl. Cover with a tea towel and leave in a warm spot to rise for 30 minutes or until doubled in size. Preheat oven to 220 degrees celsius (200 degrees celsius if using a fan forced oven). On a lightly floured board, place the dough and knead for 5 minutes. Place 6 balls, 1cm apart in a greased 20cm square tin. Place the remaining 6 balls in a separate greased 20cm square tin, 1cm apart (using 2 separate tins makes it easier to handle and allows the balls to spread). Set aside for a further 15 minutes to prove. Make the piping by sifting the flour into a bowl and adding enough water to make a paste. Pipe the crosses onto the buns using a piping bag or a glad bag with the end snipped off. Bake in the oven for 15 minutes or until the buns sound hollow when tapped. To make the glaze, place the water and sugar into a microwave safe bowl and heat for 30 seconds. Mix until the sugar dissolves. Brush the tops of the buns with the glaze. Place the buns onto a wire rack to cool. Place milk and yeast into the Thermomix bowl and mix for 1 minute, Speed 1, 37 degrees. Add flour, salt, softened butter, sugar, egg, cinnamon, nutmeg and warm water and mix for 6 seconds, Speed 7. Add the sultanas and combine for 10 seconds, Reverse Speed 5. Place in a bowl and cover with a tea towel. Keep in a warm place for 30 minutes to allow the dough to prove (it should double in size). On a lightly floured board, place the dough and knead for a few seconds. To make the piping, mix the flour and water in the Thermomix bowl for 20 seconds on Speed 4. Scrape down the sides and repeat for a further 20 seconds. Meanwhile, heat the sugar and water in the Thermomix bowl for 2 minutes, Speed 4, 100 degrees. 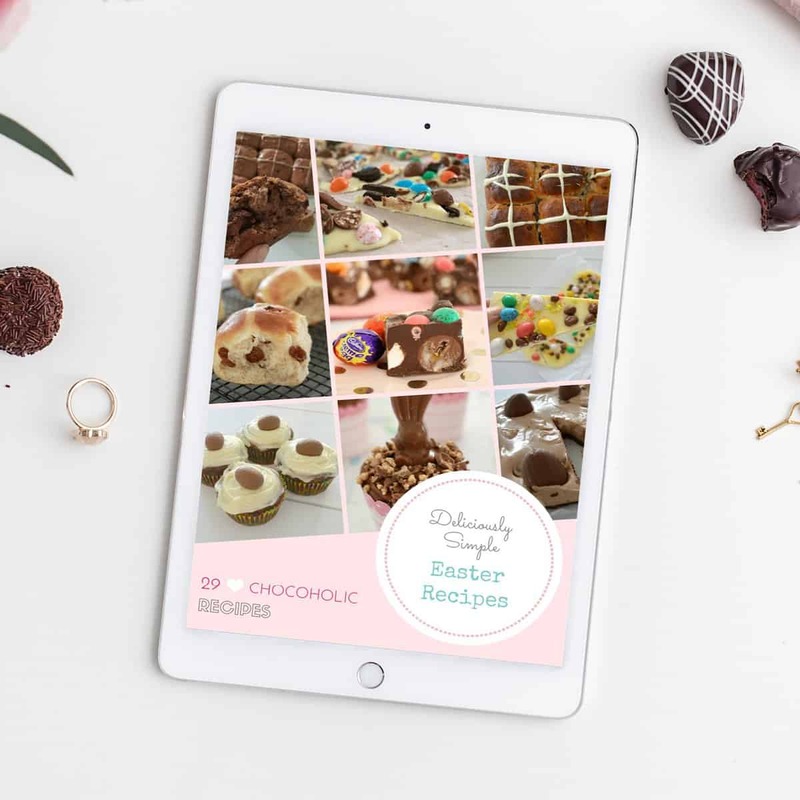 When making in the thermomix should I leave the milk and yeast for 15 min to activate before adding the other ingredients or do I skip that step? I can’t wait to try these!! YUM! 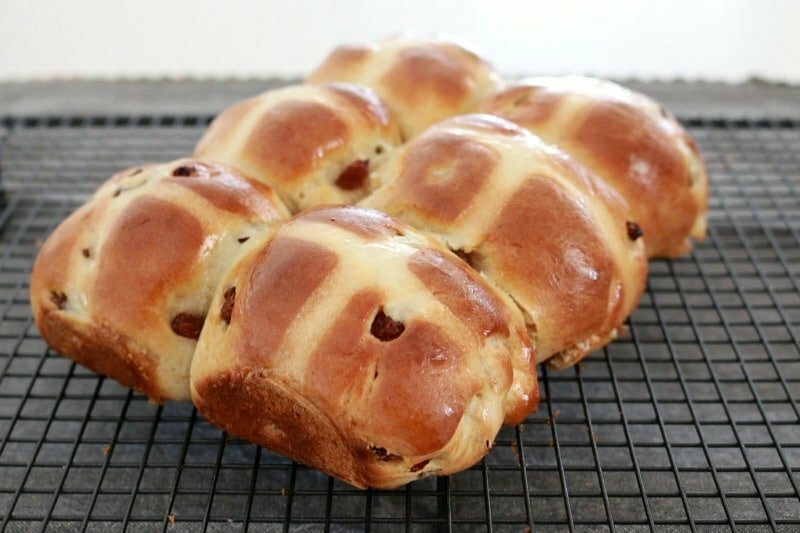 Hot cross buns are the best! 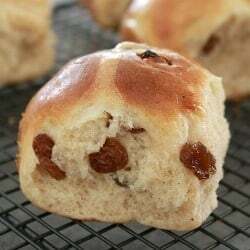 I love my hot cross buns heated under the griller and then spread with jam! Absolutely!!! Thats the perfect way to do them! Sorry but I’m with Dave. Although, have you ever poked a hole in one, jammed in a small easter egg and then put it in the oven? !